It may be Christmas Eve, but that doesn’t mean you don’t have time to whip up an impressive chocolate treat for last minute gifts or to serve to your guests. No really, I’m serious! 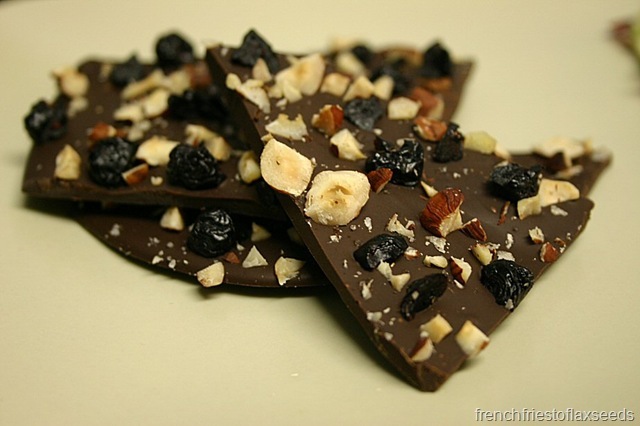 If you can melt chocolate and chop dried fruit and nuts, you are good to go. I saw a recipe for Deep Chocolate, Dried Blueberry, and Pistachio Bark in the December issue of Alive Magazine (one of my favourite *free* magazines for food and health information). I thought it looked amazing, but I wasn’t 100% sold on the flavour combination – not only did it include the blueberries and pistachios, but also lime zest. 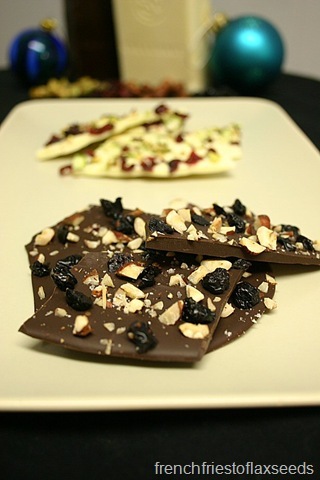 So I did some tweaking, and ended up with two decadent and delicious chocolate bark recipes to share with you. Chocolate bark is deceptively simple to make – melt chocolate, spread on some parchment paper, add things, and let it set. Because of this, I like to use a really good quality chocolate. 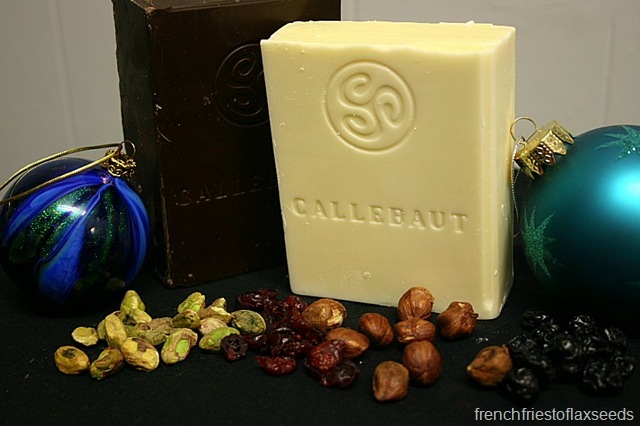 My personal favourite is Callebaut – you can get blocks at many local grocery stores in the bakery department, usually all year. It melts beautifully, never seizes up on me (and I melt chocolate over direct heat), and has great flavour. I always keep some dark chocolate and white chocolate on hand, because you never know when something will need a quick chocolate drizzle to take it from ordinary to extraordinary. 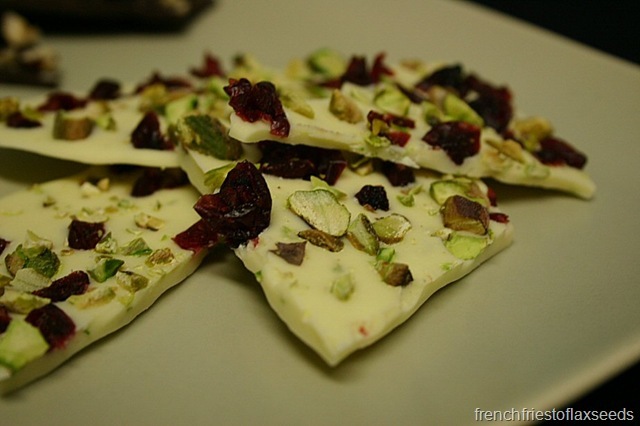 My first chocolate bark was the most festive looking – White Chocolate Cranberry Pistachio Bark. I love how it combines all of the colours of Christmas – definitely looks beautiful on a cookie plate. I used the lime zest in this one, and it gives it that little extra something. Which ever one you make (or heck, make both! ), you’re guest will love it. It looks impressive, tastes amazing, and no one needs to know you spent maybe 10 minutes max making it. 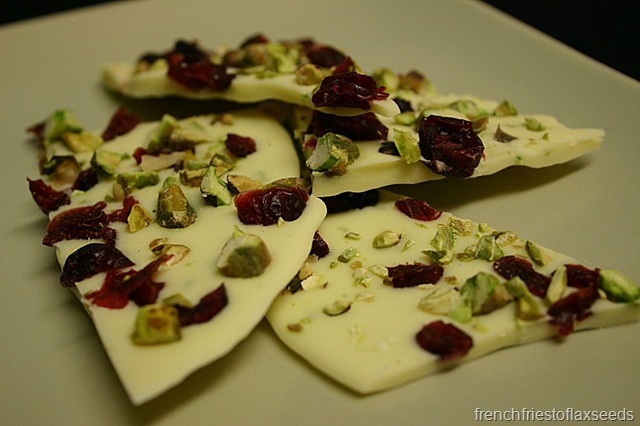 This chocolate bark just says “Christmas treat” with its ruby red cranberries and green pistachios. Lime zest adds an unexpected flavour dimension, and keeps the white chocolate from seeming overly sweet. 1. Line a baking sheet with parchment paper, and place in the freezer while you melt the chocolate. 2. Melt chocolate in a double boiler, or if you are daring like me, over direct heat (just make sure you have it on low and watch it). Once it has melted, stir in lime zest. 3. Spread chocolate into a rectangle on the parchment paper. You can make it thicker or thinner, whatever you like. It’s rich, so I make it on the thin side. 4. Sprinkle the cranberries and pistachios over the top. Place back in the freezer until set, then break into pieces. 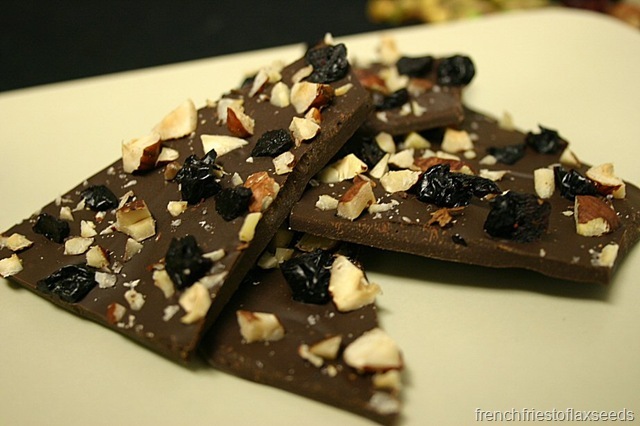 Give your chocolate bark some BC flair with dried blueberries and hazelnuts. Sea salt takes the chocolate to another level. This decadent treat not only looks impressive, but is packed with antioxidants, so you can feel even better about indulging a little over the holidays. 2. Melt chocolate in a double boiler, or if you are daring like me, over direct heat (just make sure you have it on low and watch it). 4. Sprinkle the blueberries and hazelnut over the top. Sprinkle a very tiny amount of sea salt over the bark (too much, and it won’t be balanced). Place back in the freezer until set, then break into pieces. 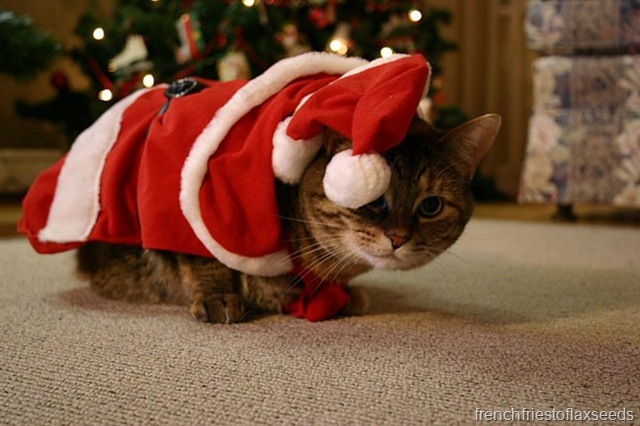 Merry Christmas to all my readers – I hope you have a wonderful, delicious, and family filled holidays! That bark looks just lovely! Way to go to use Callebaut… I’m a huge Valhrona fan, thanks to my sister. Callebaut is a close second 🙂 Merry xmas!